I’m going to assume that you know the history of Genoa, and its status as a Portland institution slowly sliding over the years as the restaurant began to be seen as a staid, old-fashioned relic of a time gone by. It closed in November 2008, changed owners, was completely remodeled, and reopened exactly a year later. Anyone familiar with the original layout will be startled by the change in décor. 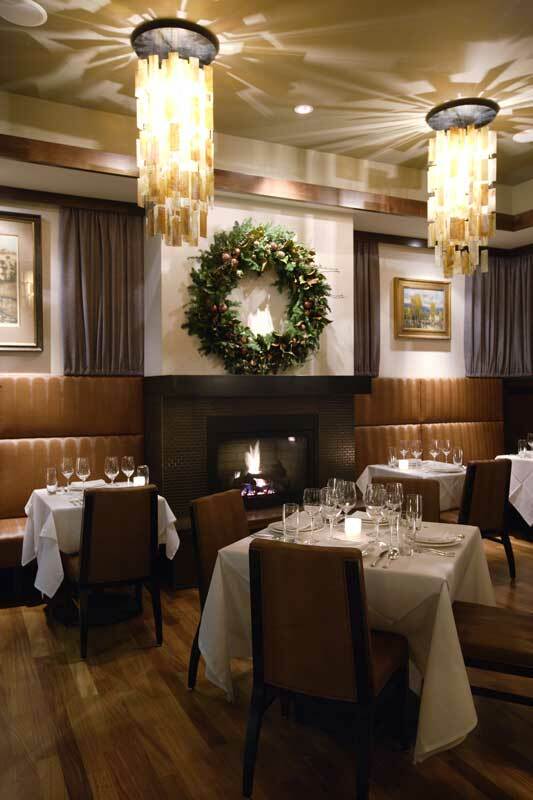 The front of the restaurant is welcoming and airy, with a lush, modern feel and soft lighting, a fireplace warming both the ambiance and the room. Sound absorbing materials, as well as the wide spacing between tables, keeps the background noise to a comfortable level. Modern chandeliers pull all the elements together, giving a sophisticated feel, and making it one of the more romantic dining rooms in Portland. It scored second only to Paley’s in our 2011 readers’ survey. Genoa also added an area at the back of the dining room, which can be sectioned off for groups. As of this writing, the menu is prix fixe, a 5-course meal for $65. They rotate monthly, which allows Chef David Anderson to focus on both a small quantity of dishes and a different region of Italy with each iteration. The starter and salad are predetermined, but you can pick your pasta dish, main course and dessert. There is also a 5-course pescetarian/vegetarian menu. I should start with the presentation; the platings are absolutely stunning. I’m not a fan of the ‘huge plate with a little pile of something in each corner’ style, but I can’t argue with the artistry. 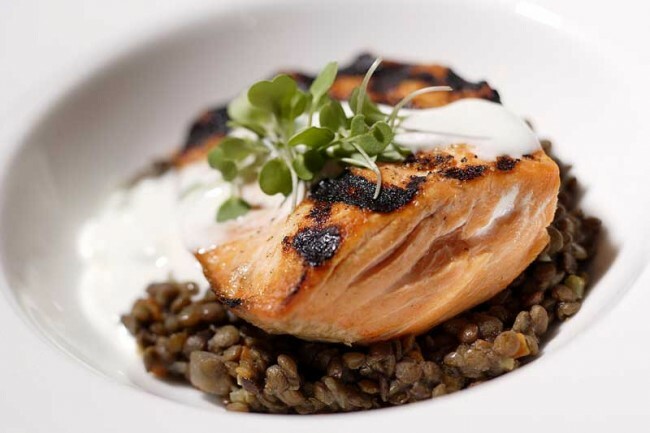 Under the deft hand of Daniel Mondok, every dish is beautifully composed and finished. Meals begin with an amuse bouche, last month a single mussel, glistening on a bed of slaw. It was perfectly cooked, and had a lovely smooth and creamy texture. Unfortunately, the underlying slaw was so redolent of competing flavors you couldn’t taste the mussel. The resulting pairing was a waste of a good mollusk. On another night, a warm amuse bouche was served in a single cold spoon, which ruined the effect. I’ve had the Trio d’ Ostriche several times. Local oysters are prepared three ways. All had a fresh, briny taste, and were nicely plump. The crudo, with lemon and fennel semi-freddo, was pleasant enough, but the texture was firmer than it ought to have been. I didn’t care for the baked oysters; the coating was too ‘sandy’. The tomato jam on the last was nice on its own, with lots of flavor – tart, but with sweetness and a nice bright color, the Calabrian chile popping up at the end to surprise me. But I’m a purist; I like my oysters virgin; frying, baking, sautéing… not so much. What’s the point? You lose that perfect moment when you can smell and taste the ocean breeze wafting past, whispering to your senses. 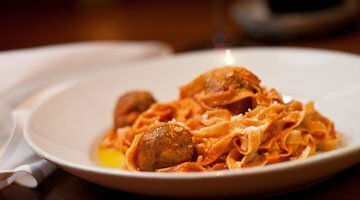 All of the pasta is house-made, and is generally excellent and cooked al dente. One evening I tried the Raviolo de Pesce Spada – one large raviolo stuffed with a moussaline of swordfish and artichoke hearts. 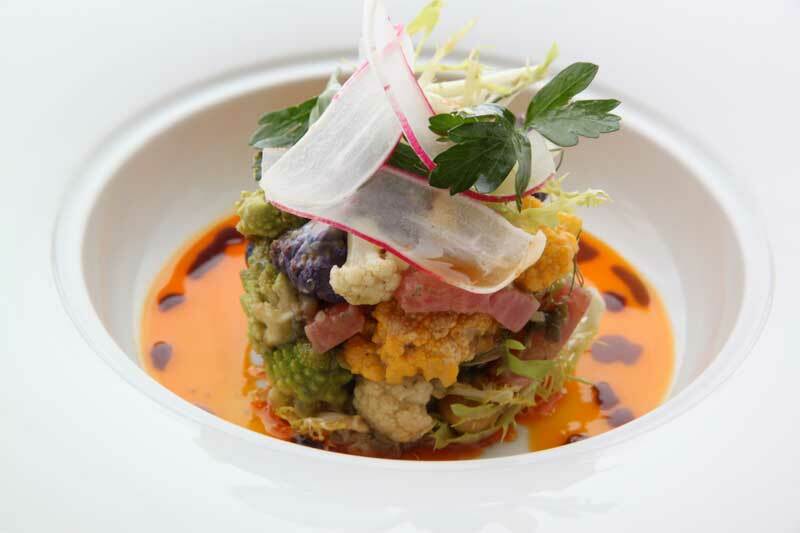 It is flavored with leeks, orange and herbs and served in an aromatic consommé with tomatoes and capers. The consommé was flavorful, light but tasty. The leeks and herbs peeked through, but I felt the acid in the orange cut through some of the richness that I associate with a good consommé. I liked it, but wonder if it was a pre-made base. The previous week I’d taken a trip to Los Angeles where I had consommé which was more flavorful and rich, with just enough fat in it to lightly coat your lips. This version paled in comparison. Though the ravioli was al dente, the swordfish was as tough as an overcooked chicken breast. That the entire dish was served at room temperature didn’t support the cause. I loved their Lasagne ai Carciofi. The layers of pasta are airy, with a rich purée of artichokes and Yukon gold potatoes. Though the potato flavor was a bit buried, the raw, shaved baby artichokes were warm and earthy. The Sicilian pesto was strong and bright, with little kicks of crushed red pepper to pull everything together. The Pasta con Sarde, semolina spaghetti with Italian sardines, was also enjoyable. Though the sardines are a bit overwhelming, the pasta with pine nuts is great, and it grew on me as the ingredients got stirred mixed together. Raisins and capers made for nice texture with little bursts of flavor, and caramelized fennel and red onions gave a long finish. 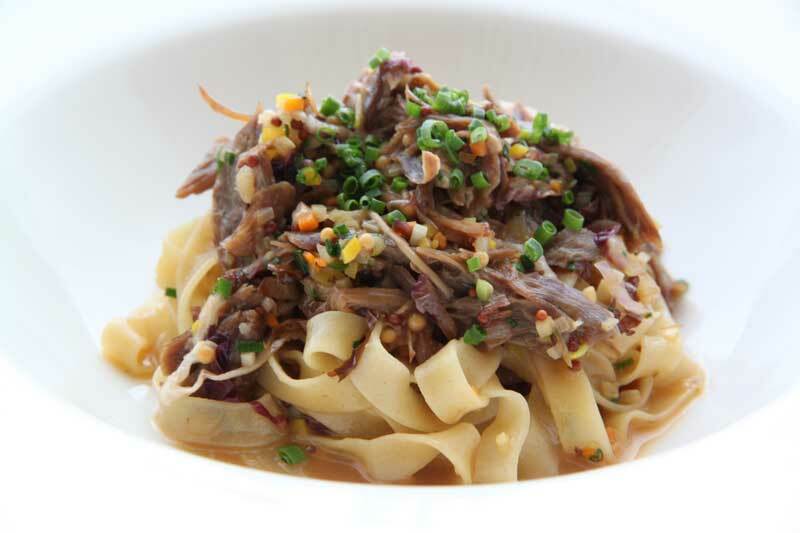 I had mixed feelings about the “Tagliatelle con Ragu d’anatra with House-made Pasta and a Savory Ragu of Muscovy Duck, Aromatic Vegetables, Warm Spices and Radicchio“. The radicchio was really good, but the rest failed to impress. All the flavors came through; perhaps too many were competing against each other, and all were too subtle. One of my companions brought up the adage, “sometimes less is more”. Recently the salad was Insalata di Mele, Fichi e Chicoria – composed of Queener Farms apples, figs, chicories, scamorza cheese fritters and drizzled with mosta cotto. The apples were sweet, crisp and delicious, the figs perfectly ripe, tasting like the sun and the Mediterranean. The only flaw was the milky blandness of the scamorza – a pretty but unnecessary ornament. A few months ago, I ordered “Insalata di Cavolifiore in Bagna Cauda; a composed salad of roasted cauliflower, with radishes, hazelnuts and celery leaves, in a warm dressing of garlic, boquerones, butter and olive oil”. It was a disaster. I like all the ingredients of this dish, but the first bite had the distinct taste of something, probably the boquerones, that was past its prime. I normally enjoy bagna cauda, but the off flavor was so prevalent, the little explosions of hazelnuts were a welcome respite, as they covered the taste of everything else. Maybe something had gone wrong the night we were there, but it was almost unpalatable. One warm late summer night, we had Caponata con Carpaccio di Tonno – sweet and sour eggplant, with tomatoes, melons, celery, peppers, olives and grated chocolate, served over thin slices of line-caught wild Hawaiian ahi tuna. It was a unique blend of textures, flavors and temperatures. Each bite had a unique moment by itself, each item giving contrast against the others – the olive against the melon, the pepper against the carpaccio, and the tuna literally melting on the tongue. There are three secondi to pick from on each menu. In October, one of the choices was Pancetta in Vetro di Birra – beer-braised Carlton Farms pork belly with caramelized cabbage, pickled red onion, and apple cider gastrique. The pork flavors were terrific – fatty, crispy belly, with the fat just offset by the vinegar in the gastrique. The pickled onion to the side was a texturally perfect foil to the shimmering softness of the belly. The Couscous Trapeneses of Oregon Crawfish & Halibut was also enjoyable. It is served with roasted red cippolini onions, tomatoes and couscous. The crawfish were rich and buttery, but missing the necessary distinct sweetness normally imparted by the crustacean. Still, the broth was flavorful, and the halibut flaky tender as it should have been. The light and fluffy couscous was wonderfully fragrant in its steamy cradle of Savoy cabbage. Another successful secondi was a roasted loin of venison, Arosto di Capriolo. The meat was wrapped in house-cured bacon with delicata squash, pommes dauphine and huckleberry jus. The major ingredients are layered over rings of squash, with an ample portion of venison on one side of the plate, the pommes dauphine on the other. My venison was nice and crusty and perfectly cooked, with a great, slightly gamey flavor. The squash was pretty, and its earthiness and complex shape added interest. While the huckleberry juice was flavorful, it was way too sweet, and needed something else to give balance. The pommes dauphine – crisp potato puffs made by mixing mashed potatoes with savory choux pastry and then deep-frying, were served over a round of squash. Overall, it was a good choice, with a few minor tweaks, it would be excellent. Merluzzo in Cartoccio con Zuppa Pulgesse, or “Oregon black cod steamed ‘in a bag’ with white wine and aromatic vegetables; served with sautéed local broccoli and a rich sweet pepper & fish soup” sounded a bit daunting, and it was. The fish was slightly past its prime, still moist and tender but moving quickly towards the bad side, the accompanying vegetables unremarkable. The presentation in the bag was a little awkward at the table – lots of flourish for a decidedly disappointing entrée. On our most recent visit we were wowed by Fagiano Farcito, which, on the surface, sounded like an overwhelming conglomerate. The menu listed “prosciutto and taleggio cheese-stuffed pheasant breast with buckwheat and corn polenta, escarole and sauce Pervada (vinegar, chicken liver and anchovy) with chorizo, aromatic vegetables and herbs”. However, it was the standout dish of the night. The flavors and textures blended well, and it all worked wonderfully. There are four or five choices for dessert each night which are beautifully presented, thought they don’t always live up to that promise. Sticky Toffee Pudding, a British dessert, is supposed to be a moist sponge cake made with finely chopped dates and covered with a toffee sauce. It is a classic British dish, and one of my favorite desserts. It certainly looked beautiful, but it was like leaning in for a kiss when you are nervous; as if all the moisture had been pulled from your mouth. Perhaps it had sat for a while. A better choice is the cherry financier, a small cake that is a throwback to days gone by. 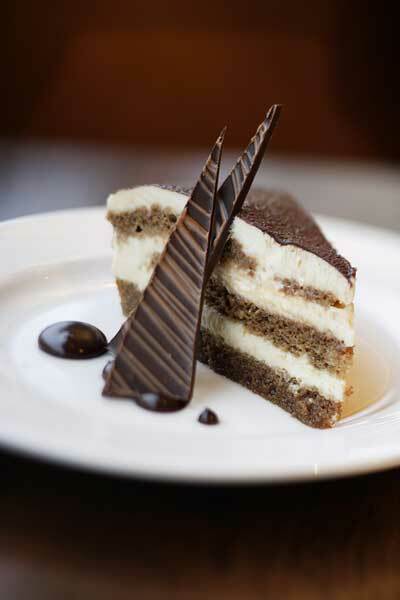 While this dessert didn’t quite live up to its classic characteristics, we enjoyed it. Here it is chocolate, with chocolate and more chocolate, and a great cherry-pinot noir sauce. If any of their soufflés are on the menu, give it a try; they have all been excellent. Finally, the bomboloni, three light balls, dusted with cinnamon-sugar, inflated with a sweet, creamy filling, and warm chocolate sauce. Now I get it every time. Some menu planning needs adjustment; at two different meals all of our selections ended up being on the sweet side, and it was too much: like having dessert with every course. Finally, on some visits the plates flew from the kitchen so fast, we barely had time to take a breath between courses, making us feel rushed, though I’ve never seen the restaurant particularly busy. The servers, while very efficient, feel like a waiter feigning a French accent to sound exotic. I’d suggest losing the pretense and the hushed, stiff tones; it sets expectations higher than are being reached, and feels dated. That being said, staff knowledge is quite good. I’ve been especially impressed with both wine recommendations and service. Speaking of wine, the selection is fairly large, with an average markup. However, the server missed an opportunity on two different nights to sell us a second bottle. Yes, there were four of us. Cocktails are properly made, just as you’d expect. I enjoy the experience of dining at Genoa, but I have never had more than a “just ok” meal there. I’d like to see them leave the current trend of “more ingredients are better”, and simplify; this is Italian food! Though there is a least one excellent dish with every menu, just as many fall just short of being really good. In the end, the restaurant seduces with a warm, romantic ambiance, but falls short of the promise. Category: Portland Restaurants Now Closed. Related posts about Genoa Restaurant. More about Daniel Mondok, David Anderson. With great excitement we planned a dinner at Genoa about a year ago. Overall, it was a great disappointment. We were seated in the back (people were “taking longer than expected” over their meals and no tables were open when we got there for our 8pm reservation), the wrong appetizer arrived for my dinner companion, the fish was undercooked and had to be remade, and, the food, after all of that was just so-so. We have not been back and probably won’t ever be. I thought your review was, as always, fair and knowledgeable. I know that you put a lot of time and work into it and I appreciate your effort. Most importantly, it gives us constructive and detailed feedback that helps us focus on where we can improve. Our goal for reopening Genoa is centered on continuing its legacy as one of Portland’s premiere dining experiences while breathing new life and energy into that experience. The past two years have been an exciting journey, and our team is always focused on pushing and moving forward to that goal. Thanks David, that was a very classy response – one that I’m sure will win you fans. As I said in my review, the food has improved with every visit, and I look forward to coming back. I’ve dined at Genoa 5-6 times since the reopening. Those meals were all among the best I’ve experienced in Portland. The service, though a bit overwrought at times, is attentive and accommodating. Spot on review. My husband and I have the same experience the two times we went since the reopening. This review can’t seem to decide what it wants to say. Besides being poorly written like most of the pseudo-jounalism here, it’s contradicting. I have eaten at the new beautiful Genoa several times in the last two years and have always left blown away. It’s an experience one can’t find anywhere else in this town. Sounds like to me, food dude, you have a chip on your shoulder and it’s made of chocolate. Because you must be dining on that and not at Genoa. Sounds like the only thing it’s contradicting is your opinion. There’s nothing wrong with the way the review was written. If you disagree with FD’s conclusions, so be it. But snarky posts like yours only detract from your own credibility. I don’t need credibility, J and J, it’s just an opinion. Just like the review, an opinion. Although, my opinion doesn’t waver or contradict itself like the opinion in this review. Thank you tremendously for your unneeded concern. 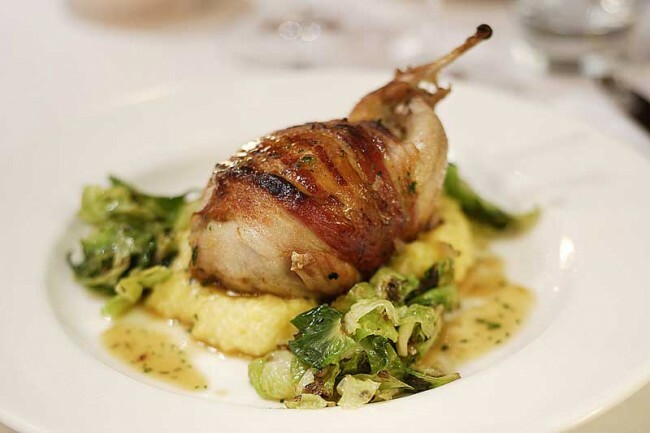 We recently dined at Genoa and found the food to be very good and the well conceived combination left all of us wanting more. The wait staff though is strange – the hushed voices and all – including strange stiff mannerisms gave us conversation later on. One person in the group nailed it – “Good servers aren’t something that you should ever really notice.” – if they are good. We would go back though – and we’d recommend it to others as well. I’ve never thought of crawfish as having that “distinct sweetness” that one justly associates with ocean crustaceans like lobster/crab/shrimp, a missing trait that I always assumed to be due to their freshwater habitat. But perhaps I’ve never had a great crawfish. soooo……that good meal at Genoa was several years ago? I think the current FD review is actually a kind review of recent our most recent meal. We’ve been there ‘before’ and ‘after’ the afters. Inconsistent seems to be the general theme. The photos of the dishes are quite nice. Compliments to John Valls and Silent Partner PDX. 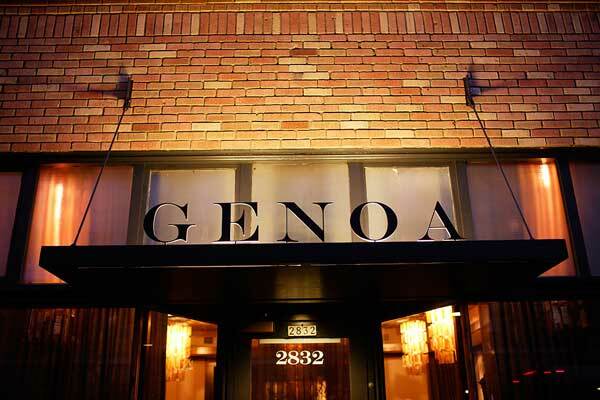 I was surprised at the critical review; my husband and I dine at Genoa a handful of times a year, and each meal is a total delight. The service is generally terrific, and we especially like the lack of annoying, loud, boisterous patrons – one can actually converse over dinner and not leave with a headache.